4Easysoft MOD Converter is quite useful MOD converting software for camcorder owners to convert camcorder MOD video to any other media players or video editor software. That makes MOD Converter requisite software for each camcorder user, for it's a MOD video converter which is designed to convert MOD files to fit for diverse applications. As powerful MOD video converter, 4Easysoft Mod Converter can convert .mod files to MPG, AVI, WMV, MP4, MOV, 3GP, RM, FLV, SWF, etc to your PC. This MOD Converter assists you in publishing your excellent videos to stream online, like YouTube, MySpace, Yahoo, Hulu, Metacafe, etc. or your personal site. Share videos with more friends in the world with 4Easysoft MOD Converter! 4Easysoft MOD Converter supports Mod, Tod, MPG, MPEG, MPEG-2, VOB as the input format, and it converts these files to MPEG-4, H.264/MPEG-4 AVC, MOV, M4V, AVI, DivX, XviD, ASF, WMV, MPEG-1, MPEG-2, 3GP, 3GPP, MKV, FLV, SWF, VOB, DV, Super VCD (NTSC, PAL, SECAM), VCD(NTSC, PAL, SECAM), DVD(NTSC, PAL, SECAM), HD H.264, HD AVI, HD MPG, HD TS, HD WMV, HD MPEG 4, HD MOV, HD ASF, AAC, AC3, AIFF, AMR, AU, FLAC, MP3, M4V, MP2, OGG, WAV, WMA. Select a variety of output formats simultaneously for source file, and let 4Easysoft Mod Converter convert it at the same time. With powerful MOD Converter, you can enjoy the videos shot by yourself on computer or other digital devices, including iPod, iPod Touch, iPod Touch 2, iPod Nano, iPod Nano 4, iPod Classic, iPhone, iPhone 3G, Apple TV, PSP, PS3, Wii, Zune, Zune 2, Xbox, Xbox 360, Google Phone, Sony Walkman, Archos, Creative Zen, iRiver, BlackBerry, BlackBerry Storm, BlackBerry Bold, Palm Pre, Motorala, LG, Sony Ericsson, Mobile Phone, Dell, HP iPAQ, General Pocket PC. 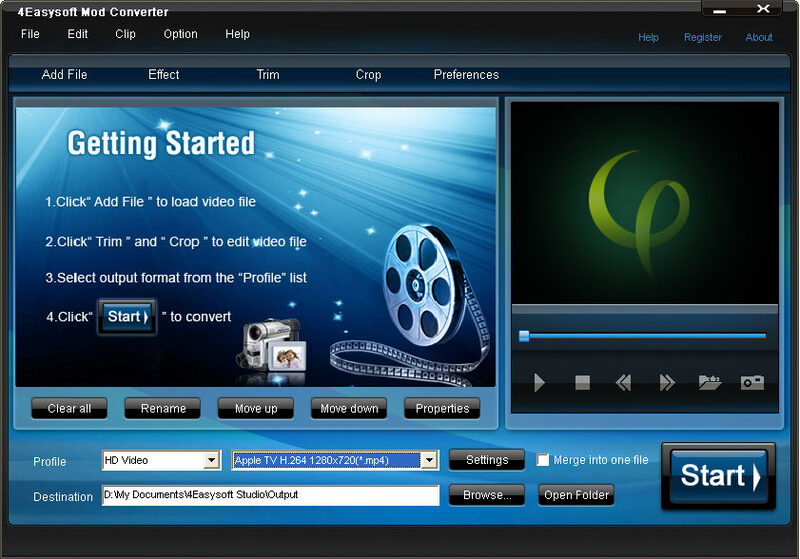 4Easysoft MOD Converter helps you enjoy successive videoby joining several video chapters into one file. To personalize your video, try to add picture or text watermark with customized transparence, position and other features in your movie. 4Easysoft MOD Converter allows you to add audio track and subtitle for your video.